I love Wes Craig's artwork, especially on Deadly Class, but when I saw that this new series was being published by Image with him writing, and the consistently interesting Toby Cypress drawing, I was intrigued, but also decided to tradewait the book, as I've been trying to cut down on my pullfile list. Last week, Craig was at TCAF, so I was happy to buy the book directly from him, and get it signed. The Gravediggers Union is kind of a poor man's BPRD. In this world, the men (because they are pretty much always men) who dig graves in cemeteries are also the people who guard the living from zombies, vampires, and other forms of undead malfeasance. The thing is, lately, things have been getting a lot worse than anyone can remember, with attacks happening with greater frequency and intensity, and with deadly ghost storms showing up all over the place. This has something to do with an ancient cult called the Black Temple, some elder gods, and a storyline that digs back to mankind's earliest days. Things don't look good, but the Union itself is more concerned with following protocol, which frustrates Cole, a veteran grave digger who has a family connection to what's going on - his estranged daughter is possibly the prophet that the Black Temple has been waiting for. 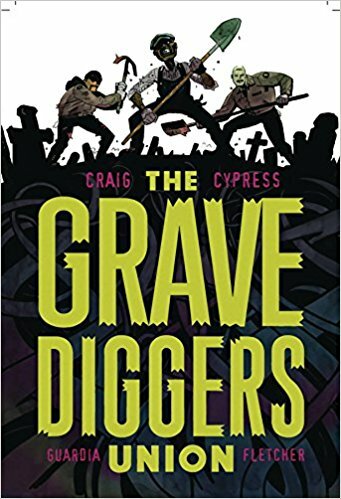 I enjoyed the story, and the way that Craig built up some of the characters in the GDU, and established the animosity between Cole and his superior in the union. I particularly enjoyed Morphea, the witch who Cole turns to for help, despite the fact that it is forbidden for the Union to communicate with witches. Cypress's art is always a bit of an acquired taste, but I've always liked it. The colourist, Niko Guardia uses digital washes to denote movement or atmosphere, and that's something that annoys me. Like the paint splatters in Wytches or the weird lines all over Supreme: Blue Rose, I find it detracts from the story more than it adds, but maybe that's just me being old and traditionalist. It does seem to be catching on lately, so I'm going to have to deal with it.